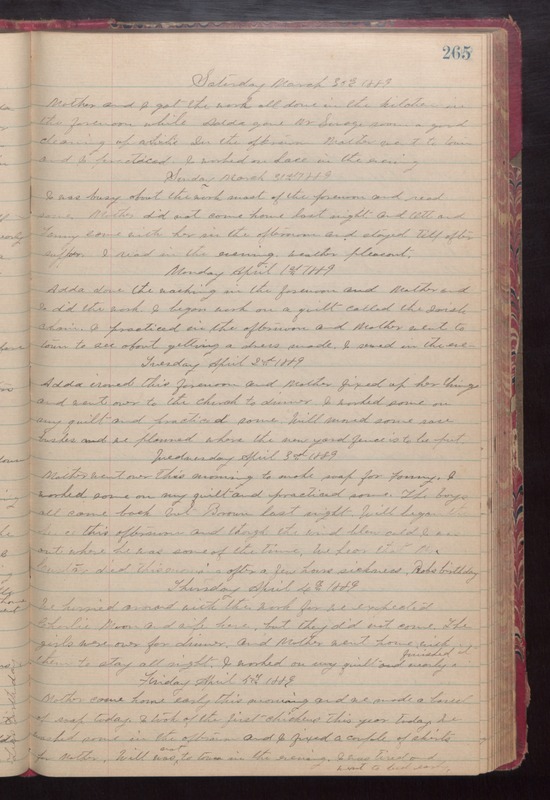 Saturday March 30rd 1889 Mother and I got the work all done in the kitchen in the forenoon while Adda gone Mr. Savage [illegible] a good cleaning of [illegible] in the afternoon. Mother went to town and I practiced. I worked on lace all evening. Sunday March 31st 1889 I was busy about the work most of the forenoon and read some. Mother did not come home last night and [Cett?] and Tommy came with her in the afternoon and stayed till after supper. I read in the evening. Weather pleasant. Monday April 1st 1889 Adda done the washing in the forenoon and Mother and I did the work. I practiced in the afternoon and Mother went to town to see about getting a dress made. I sewed in the eve. Tuesday April 2nd 1889 Adda ironed this forenoon and Mother fixed up her things and went over to the church for dinner. I worked some on our may quilt and practiced some. Will moved some rose bushes and we planned where the new yard fence is to be put. Wednesday April 3rd 1889 Mother went over this morning to make soap for Tommy. I worked some on my quilt and practiced some. The boys all came back but Brown last night. Will began the fence this afternoon and though the wind blew cold I was out where he was some of the time. We fear that Mrs. [Custer?] died this evening after a few hours sickness. Robs birthday. Thursday April 4th 1889 We hurried around with the work for we expected Charlie Moor and wife here, but they did not come. The girls were over for dinner and Mother went home with them to stay all night. I worked on my quilt and nearly finished it. Friday April 5th 1889 mother came home early this morning and we made a barrel of soap today. I took of the first chickens of the year today. We washed some in the afternoon and I fixed a couple of skirts for Mother. Will was not to town in the evening. I was tired and I went to bed early.